I’ve been on a pillow kick again. 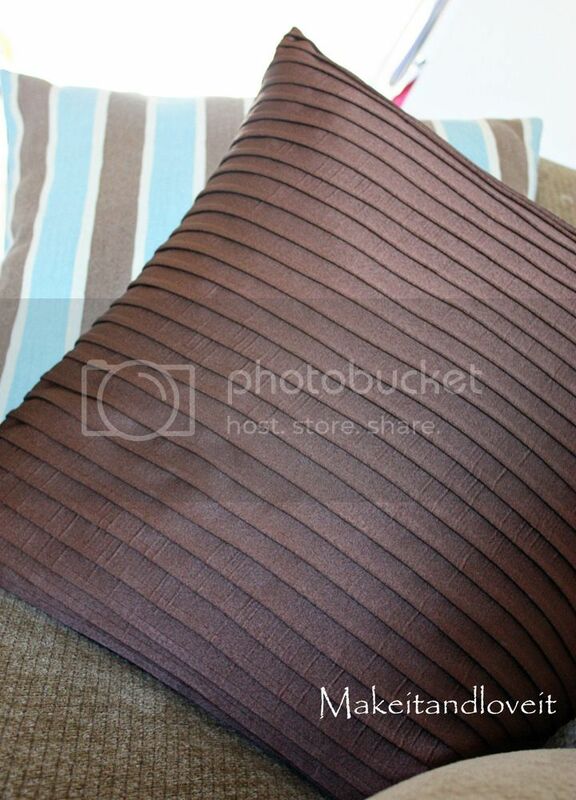 But I love the texture that this pleated pillow gave to our chair. A perfect way to liven up furniture. 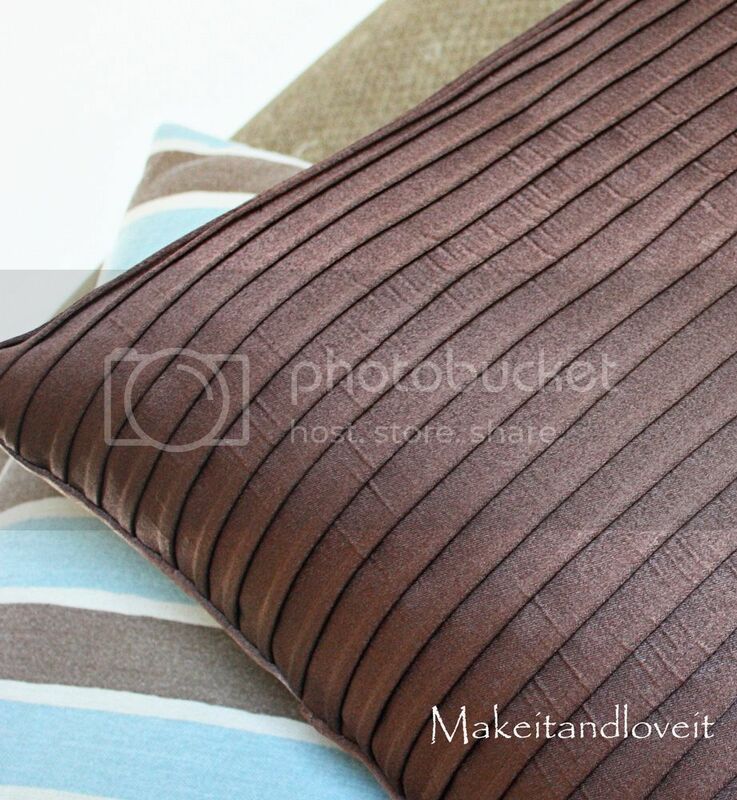 Want to pleat your own pillow cover? Then I marked every 1 1/4 inches along the edge of the 60 inch side. (But I started about 2 inches from one end, to leave that for the seam allowance.) I folded over that edge and used it as a guide to mark the same marks along the middle of the fabric and the other end. And then I added more marks about a 1/4 way up and 3/4 of the way up. These marks, when lined up, will act as a guide as you’re folding over the fabric and sewing….. When opened up, it looked like this. Then I continued along, making more and more 1/4 inch seams, folding right where the marks were. Until I had enough seams to stretch 21 inches. Make sure and iron/steam your pleats completely flat, and pull the fabric as you are ironing……to be sure that you are not puckering the fabric underneath. Then using the same instructions here, attach this pleated piece to your back pieces with right sides together……to create the slip cover. And then toss onto that chair. This is so cuteeeeee! Love it! cute, thanks for the tutorial! Beautiful. I will definitely be bookmarking this page for the someday when I get a new couch! Love it! 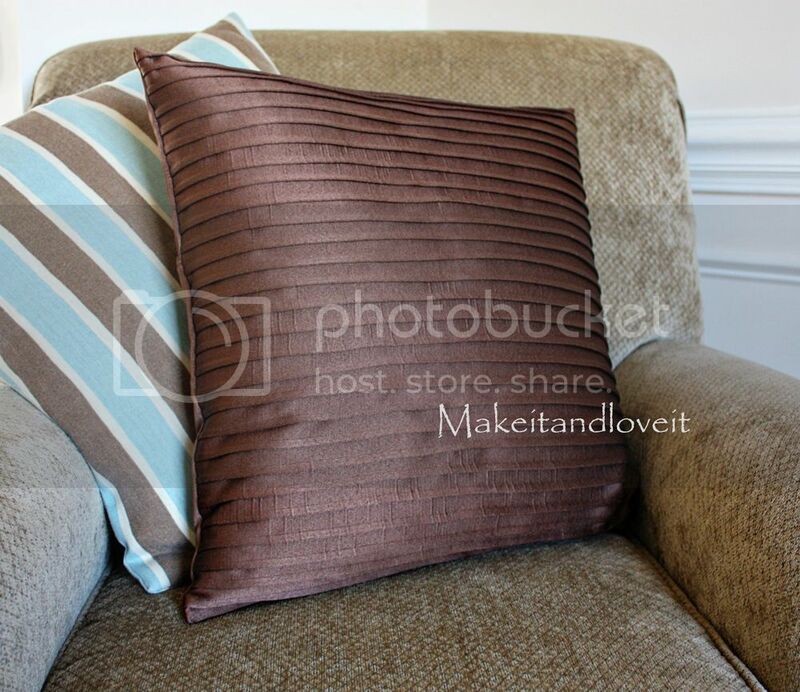 That's fab – I'm planning on making some cushions for my sister's birthday just like this…will definitely try this out! WOW gorgeous! Thanks for the great tute!! WOnderful and a great tutorial on how to sew pleats! THank you. Wow, your pleats are SOOO nice! I love this. Thanks so much for sharing, I'll be linking. What a classy pillow! Thanks for sharing. That is gorgeous. And I only wish I could sew that well. Mine would look more like a pleated pillow and a ruffled pillow had a terrible accident! Hey i love your blog, and the tutorials are amazing. Love this pillow. Your tutorial makes it look easy. I don't know if I'm up to that level of sewing yet. I need to make some new pillows. Very pretty! Thanks for the tutorial — tutorials take a lot of time and effort to make and we appreciate it! Love this tutorial! I am going to have to try this! It looks beautiful, but golly, you must have a lot of patience! I am way too lazy for all those tiny pleats. I could maybe do big ones. ;) It turned out great, though! Oh how I wish I could sew… and one up from that… wish I had a sewing machine! Ha! Lovely pillows! How pretty! You make it look so easy. Pleats have always scared me. I just might give this a try. so pretty and so simple!! Love your pillows. I'm trying to brighten up our room a bit! Thanks for the ideas! This was so helpful and exactly what I needed to make a cushion for my son's rocking chair. Thank you so much! great tutorial and I purchased the material to make on Friday, but can you tell me how you get the chalk off of the pillow front without washing? What kind of machinery has been used for this tutorial? Thanks also for the tutorial. It make sense. Thanks for the lovely post. I tried to work it out on silk but mine are not getting flat like yours even after ironing, can you please help out?? ?